Who else than naval war drove the Jan/Feb T°C down in Denmark? Kobenhavn –378.5 (204.0); Fanø – 349.9 (208.2); Hammershus - 305.6 (176.4); Bogø – 438.0 (235.0). The lowest winter temperatures noted had been for December(-22.2°C); January(-24.3°C); February (-27.4°C); March (-22,0 °C). 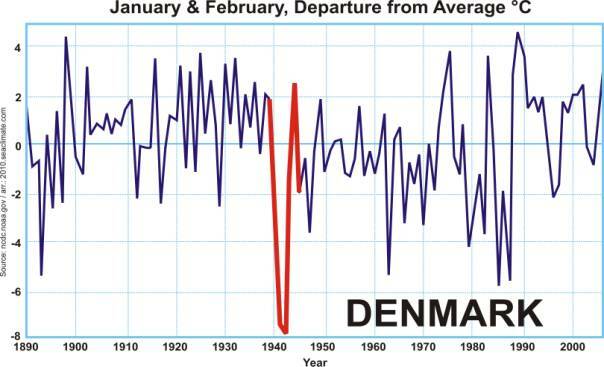 “It is Denmark’s worst winter since 1860”. (NYT, 15 February 1940). 28 December 1939; Snow storms sweep Denmark (Frankfurter Zeitung, 29 December 1939). 3 January 1940; Heavy snowstorms reported again from Denmark and traffic at Jutland is affected. (Neue Zürcher Zeitung, 03 Jan. 1940). 17 January 1940; In Copenhagen: 14.8 degrees below zero Fahrenheit (-26°C) was registered early today; there was no sign that the cold wave would abate soon. Heavy snowstorms accompanied the cold, and traffic in many parts of Denmark was impeded or brought to a standstill. (NYT, 18 January 1940). 22 January 1940; Severe snowstorms swept Europe from the Adriatic Sea to Scandinavia. (NYT, 23 January 1940). 11 February 1940; Copenhagen. Temperature is still dropping today and is between 7 degrees above and 5 degrees below zero Fahrenheit in Denmark. Due to energy shortage the government ordered drastic restrictions forbidding the use of hot water, geysers and kitchen pipes until 1 April, getting the whole of Denmark splashing in bathtubs to get its last hot water bath for some time to come. (NYT, 12 February 1940). ). Similar shortages had been reported in Germany three weeks earlier: Nazis Tighten Water Ban. Berlin Heating Plants to Issue it Only Twice Weekly. (NYT, 20 January 1940). 13 February 1940; Copenhagen. The temperature has dropped to 13 degrees below zero Fahrenheit (-25°C). (NYT, 14 February 1940).